Once you have created your organization, you can get started by adding members to it. As opposed to personal apps, apps in an organization do not have app members. Members in an organization have access to all the apps in it. 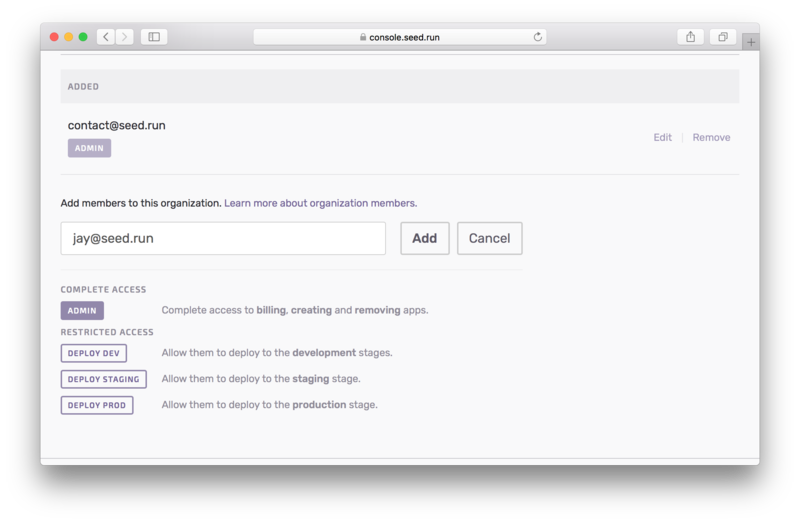 And you can manage members roles across all the apps in an organization. Let’s start by adding members. From the settings screen of your organization, view the members that are a part of it. Here you’ll be able to add new members. Add a member to the organization using their email address. 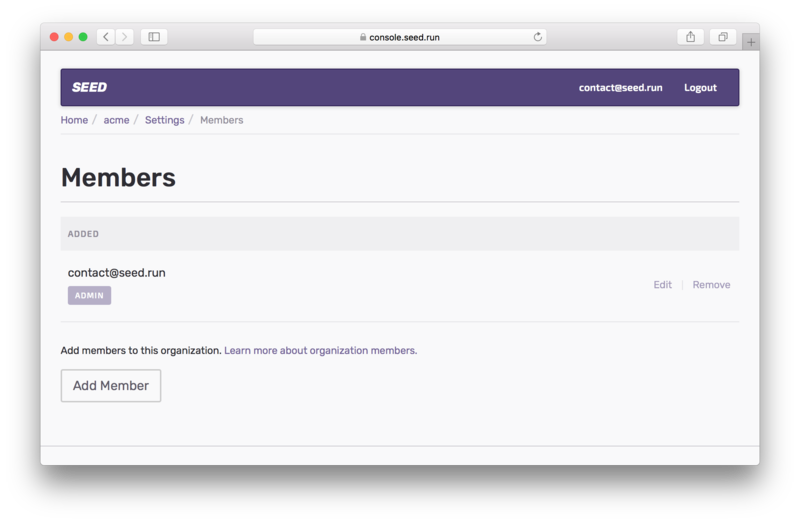 If you are adding a member that doesn’t have a Seed account, they’ll be asked to create one with the email address that you specify. You can also assign them a role while adding them to the organization. There are a few different member roles in Seed. Let’s take a quick look at them. Admin Admin members have access to all aspects of the organization. They can add or remove apps, stages, and services. They can add or remove any member of the organization. And they also have access to billing. Deploy Dev Members can only manage and deploy to development stages in the apps that are a part of the organization. Deploy Staging Members can manage and deploy to staging and dev stages in the apps that are a part of the organization. 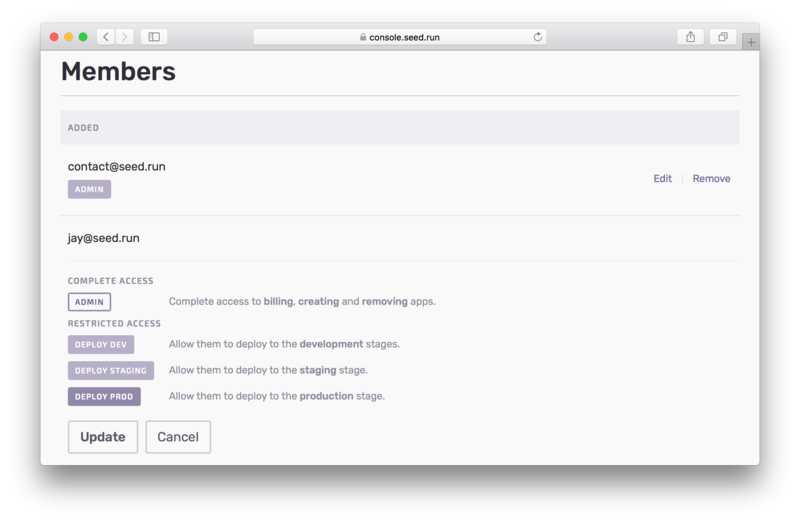 Deploy Prod Members can manage and deploy to production, dev, and staging stages in the apps that are a part of the organization. Allowing a member to deploy to dev, staging, and prod is not the same as granting them admin access. Also note that by granting Deploy Prod access, forces you to grant them Deploy Dev and Deploy Staging access. And granting Deploy Staging access automatically enables Deploy Dev access. Once a member has been invited or added to the organization, you still have the ability to go in and change their roles. Finally, you can remove a member from an organization and they will no longer have access to the apps in the organization.